For this Halloween, would you like to try wearing something different from the typical ghost, vampire, or devil costume? Why not try on a Benjamin Franklin costume and become historical rather than scary Halloween character this year? It sure will be a welcome break from the usual assortment of costumes you see during a Halloween party. Benjamin Franklin is famous for his inventions and experiments with electricity. Among his famous inventions are the lightning rod, bifocals, and the Franklin stove. Moreover, aside from these inventions, he also founded the first ever public lending library in the United States. He also formed the very first fire department in Pennsylvania. For this year, why not pay tribute to this respectable man. Anyone will show respect even to a Benjamin Franklin costume due to the legacy he had left to our country. 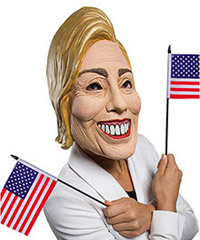 You also can even make use of this outfit for school plays, reports, and the 4th of July celebration. Take a short detour and take a look at the best Ben Franklin costumes available online. Suit up as one of America's Founding Fathers. 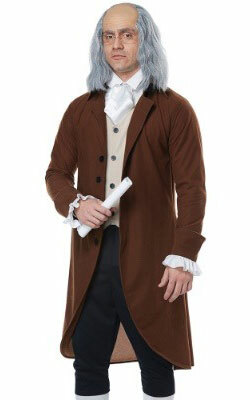 This handsome Ben Franklin costume will perfectly capture his historical look. This outfit is great for costume parties, historical events, and theater. Available in older teen (small) and men sizes (medium to x-large). This is the kid's version of the fancy Ben Franklin costume. This outfit is great for any school presentation for history class, theater, and patriotic events. Still can’t figure out who you’re going to be in this year school Halloween ball? 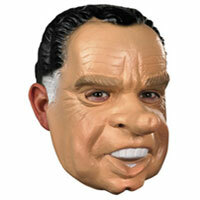 Become a dignified figure of history this time around. Impress the school crowd in a jacket with attached vest and white cuffs, matching knickers, and a white jabot. Don’t forget to finish up your Ben Franklin Adult costume by adding a wig, white socks and shoe buckles, and glasses. This Benjamin Franklin costume is available in one size to fit most adults. It’s going to be a fantastic night, no nightmares on this street for sure. Benjamin Franklin is recognized as one of several Founding Fathers of the United States. He was many things in his day – an inventor and a scientist, an author and a printer, a political theorist and politician, a postmaster and civic activist, as well as a statesman and diplomat. Who says you only get to wear historical costumes during the 4th of July parade or that yearly History school presentation? This year, show your patriotism by dressing up in a Benjamin Franklin costume. It’s possibly one of the best Halloween costume ideas around since you can use the very same Ben Franklin outfit to other events as well. It’s versatility as an outfit makes a Benjamin Franklin costume a great buy. For the price of one, you can wear during many occasions, not just Halloween or Fourth of July, but also during a school presentation or a history class project. And remember, get the right accessories to go well with your Ben Franklin look such as the glasses and the wig. It’s the small details such as these that make the big difference so that people recognize who you are. By the way, are you familiar with the story of Benjamin and the kite?